2017 was a progressive year for Revelstoke Bear Aware. There were 154 reports concerning black bears made to Revelstoke Bear Aware and the conservation officer service. The Conservation Officer Service destroyed 4 black bears in 2017 as compared to 24 in 2016. There were four incidents where bears broke into houses and destroyed property. The first reported bear sighting in 2017 was on April 24 and the last reported bear sighting was on December 16. Garbage continues to be the number one attractant for bears in Revelstoke with 66% of bear sightings being associated with garbage as an attractant. All of the destroyed bears were killed as a result of becoming conditioned to eating garbage. Bear resistant garbage collection systems significantly reduce human-bear conflict where they are installed, as seen in Fernie and Golden, BC where a new collection system was installed at the end of 2016. Revelstoke Bear Aware has continued to encourage the City of Revelstoke to implement a bear resistant garbage collection system in Revelstoke and has continued to provide information regarding possible avenues to implementing such a system. We recommend that the process of bear proofing the garbage system in Revelstoke begin by installing centralized bear resistant bins in mobile home parks where the limited availability of a secure garbage storage leads to higher rates of human-bear conflict, specifically related to garbage not being stored securely. This is due to the limited availability of a secure garbage solution. Unmanaged fruit trees were another common attractant for bears in Revelstoke with 33% the remaining instances of bear sightings being related to fruit trees. The Gleaning Project was very active this year and also encouraged people to glean their own trees and donate their fruit to the project. Revelstoke Bear Aware partnered with the Revelstoke Local Food Initiative (LFI) again this year to harvest 1700lbs of fruit, of which 456lbs were donated to the Food Bank as either fresh or preserved fruit. The role of Revelstoke Bear Aware was primarily to provide a volunteer workforce and to locate properties that required the service through our door-to-door campaign and other advertising strategies, while the LFI coordinator managed the harvest and preservation of the fruit. 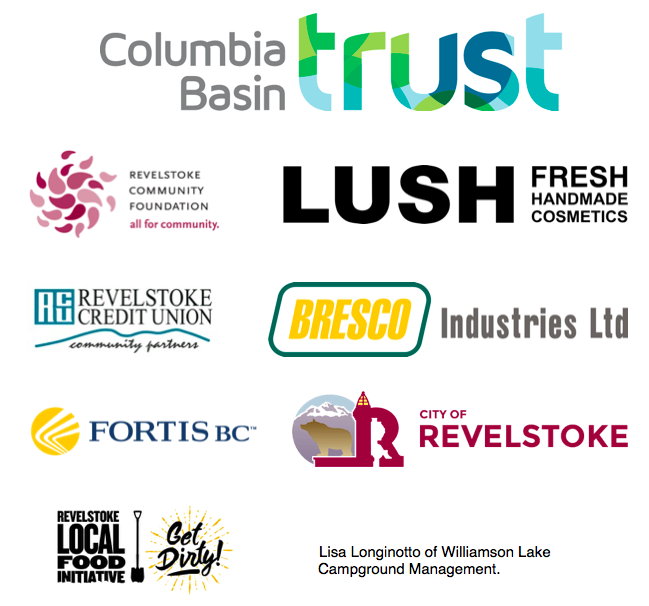 Revelstoke Bear Aware delivered 22 presentations, contributed to 3 City Council meetings, and attended 10 public events. We also held 3 workshops providing education on pruning, electric fencing, and bear management. Through these events we reached a total 1350 people. Two door-to-door campaigns were conducted in conjunction with the Conservation Officer Service. Revelstoke Bear Aware worked with the City of Revelstoke to increase bylaw enforcement in areas of high bear activity and numerous residents and businesses were fined. The Revelstoke Bear Aware Facebook page was utilized and post views reached over 122,581 views. Numerous posts regarding attractant management and the Gleaning Project were made to the Stoke List. Revelstoke Bear Aware issued 3 press releases and gave 6 interviews. Bear in Area lawn signs were deployed in areas where bears had been reported. Feedback continues to suggest that the signs are very effective at raising awareness and reminding people to secure attractants. Signs were deployed 17 times during the season, for an average of around 5 days at a time giving a total of 85 sign/days in 2017. In addition, signs were loaned to several campgrounds and resorts so that staff could deploy signs when bears were seen in their area. It would not have been possible to deliver the Revelstoke Bear Aware program to so many members of the community without the support from volunteers. This year 43 volunteers gave a total of 107 volunteer hours to Revelstoke Bear Aware. Follow the progress of the Columbia Shuswap Regional District’s move to create an organic waste disposal system in Revelstoke. Investigate what this organic waste disposal program will mean for bear-proof garbage disposal in town. Investigate how to make bear proof household garbage bins available to individual homeowners upon request. Continue to operate the Gleaning Program, to ensure unused fruit is available to our community and does not become a bear attractant. Set up an online application so that gleaners and people with excess fruit can connect independently of the Gleaning Program.